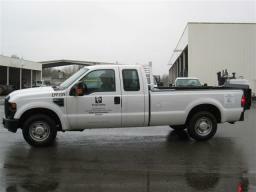 The King County Department of Transportation (KCDOT) in Washington state currently runs 20 Ford E-series vans and F-series trucks, each equipped with a ROUSH CleanTech dedicated liquid propane autogas fuel system. Project: To address global warming in the Puget Sound region by decreasing emissions from transportation. Cost savings: More than 50 percent fuel cost reduction, resulting in $1,700 per vehicle, per year savings. The King County Department of Transportation (KCDOT) in Washington saves more than 50 percent per year on fuel costs for its propane fleet vehicles. They currently run 20 Ford E-series vans and F-series trucks, each equipped with a ROUSH CleanTech dedicated liquid propane autogas fuel system. With these 20 vehicles, 120,000 fewer pounds of carbon dioxide are emitted into the air each year, and KCDOT uses 15,300 fewer gallons of gasoline. ROUSH CleanTech is based in Livonia, Mich.
King County has taken a proactive stance in cleaning up the Puget Sound region’s environment by working to reduce pollution and greenhouse gas emissions, protect and restore natural habitats, promote healthy lifestyles and use resources wisely. “Public fleets in particular have a responsibility to take the lead and take steps to achieve significant greenhouse gas reductions within their own fleets,” said Robert Toppen, equipment supervisor for KCDOT. “We take pride in doing what we can to protect our sensitive environment.” For years, King County has worked to stay on top of emerging advances in environmentally conscious products and procedures. Although KCDOT powers more than 280 of their fleet vehicles on alternative fuels, including electric, compressed natural gas, ethanol and hybrids, they purchased the propane autogas vehicles to meet the needs of employees who carry tools to job sites. The under-mounted propane tank allows more room for transporting toolboxes and equipment. KCDOT also installed an onsite propane autogas refueling dispenser for employees. Through its contract with the propane distributer, the county received installation and training at no cost. “A big advantage is the low cost of propane autogas,” Toppen said. “Our propane autogas vehicles save us 50 percent in fuel costs alone — and that’s without any additional tax incentives.” Historically, propane autogas costs 30 to 40 percent less than gasoline and 50 percent less than diesel. KCDOT tracks their vehicles’ maintenance and performance. 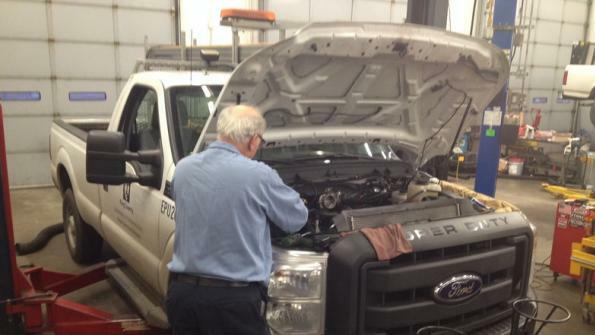 “Our technicians have completely accepted these propane autogas vehicles. There are no maintenance concerns at all,” said Toppen. In the photo at right: a KCDOT vehicle that is equipped with a ROUSH CleanTech system. Propane autogas is the third most commonly used engine fuel worldwide, behind gasoline and diesel. Propane autogas burns cleaner than gasoline or diesel, with 20 percent less nitrogen oxide, 60 percent less carbon monoxide, up to 25 percent fewer greenhouse gas emissions, and fewer particulate emissions when compared to gasoline. The fuel is safe, non-toxic and clean, resulting in low maintenance costs over the lifetime of a vehicle. In this video, Lynn McLean, fleet manager at the Flint, Mich., Mass Transportation Authority tells why his agency chose propane autogas for its fleet of paratransit vehicles.